50019 at Crownthorpe on the Mid Norfolk Railway Following a significant period out of service the Class 50 Locomotive Association's machine, 50019 Ramilies, made a welcome return at the Mid Norfolk Railway's April 2009 Diesel Gala. Ramillies is seen here tailing the 09.50 Wymondham Abbey to Dereham service on the 29th March 2009 at Crownthorpe. Following a significant period out of service the Class 50 Locomotive Association's machine, 50019 Ramilies, made a welcome return at the Mid Norfolk Railway's April 2009 Diesel Gala. 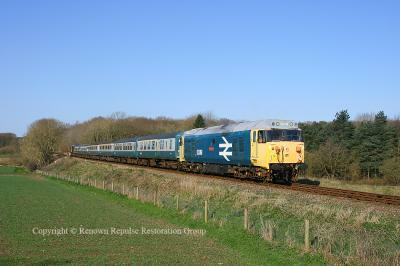 Ramillies is seen here tailing the 09.50 Wymondham Abbey to Dereham service on the 29th March 2009 at Crownthorpe. 50019 Crownthorpe 24th September 2011 50019 Ramilies is seen passing Crownthorpe on the Mid Norfolk Railway on the 24th September 2011 with a morning service from Dereham to Whymondham. 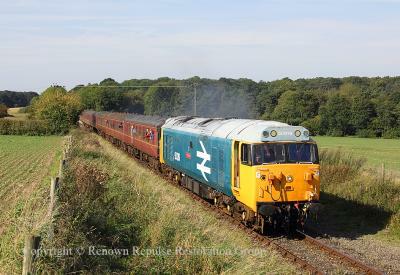 50019 Ramilies is seen passing Crownthorpe on the Mid Norfolk Railway on the 24th September 2011 with a morning service from Dereham to Whymondham.